Rick Meyers, who produced eSword, the best free PC bible software, has now produced an online version with spectacular results. Whilst not as powerful as the stand-alone eSword package it does mean you can access large parts of the eSword package even if you use a Mac or are away from your normal computer. 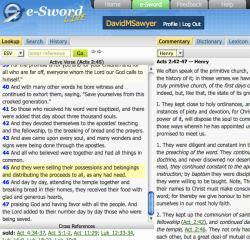 The online eSword is easy to use, quick at accessing bible verses and commentaries and is also a powerful bible study option. Give it a try, it might just become your online bible of choice! If you use eSword without creating a free account then the number of translations and extras you have access to are limited. The default translation is ESV, and you also have Matthew Henry’s Concise Commentary, the Easton dictionary, the Strong’s lexicon and a selection of topics . This may suit your needs if you like the ESV (which is a superb translation) and just need to quickly look up a verse. Amplified Bible, Afrikaans Ou Vertaling, Contemporary English Version, Chinese Union Version (Simplified, Traditional), Dutch Staten Vertaling, English Standard Version, French bibles x2, Finnish Pyha Ramattuu, German Bible x2, God News Bible, God’s Word, Italian bible x2, various King James versions, Latin American bible, New American Standard Bible, Revised Version, Vietnamese Bible and more! Albert Barnes, Adam Clarke, Matthew Henry (concise and full), Jamieson Fausset and Brown, The People’s New Testament and Robertson’s Word Pictures. Brown-Driver-Briggs’ Hebrew, Strongs Hebrew and Greek, Thayer’s Greek. In other words, you have access to a wealth of different bible study resources. So, Just how easy is it to use? Is it too slow with all the options available? You can see the layout to the right and it is very logical. On the right you have the selections for commentaries, dictionaries, lexicon and various topics. On the left three quarters of the results section have the selected bible verses, whilst the bottom quarter has cross references. It is a very good structure, which has both a flexible width and height. This means you can make it fit in to less than half your screen easily without having to scroll around. You can’t adjust the layout within the screen as you can on the PC eSword version. However, this really doesn’t detract from its use as the automatic adjustment always fits well. The presentation is very clear and easy to use, with a good choice of fonts. It just works, without being anything groundbreaking, helping to keep the design clutter free. What instantly struck me was just how quick eSword was to use. Even with lots of bibles, commentaries and dictionaries selected the results appear very quickly. You can choose your translation or commentary via a drop down menu, and the commentary will automatically update based on the verse selected. 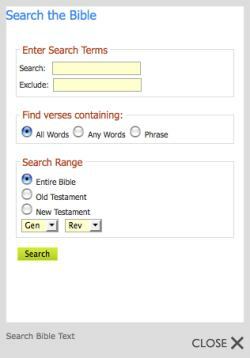 You can navigate the bible either by typing in the reference or searching for a word. Once again the speed is impressive even when searching for a common word. Searching for ‘hope’ came up with the 164 verses in less than one second. You can then click on any of the verses to read them in context. There is a picture of the search box to the right, which has several different options to help you narrow down your search. The verses that you have recently used are saved in the history section should you wish to backtrack on your reading. Using the online eSword is simple, and takes a matter of minutes to know exactly where everything is. Despite this, it is actually a very powerful online bible with lots of resources. Finally, there is also a help page which shows how to link to specific verses from your website. Good Day, I am new on Esword, and I would just like you to teach my how to use esword, as I haven’t got the slightest idea where to start first. I am interested in pursuing a course of Bible Study on the web, to the highest level. While I am not so concerned about the level, because my main concern is to learn all I can about the WORD, so that I can teach and preach effectively to the extent that I will be able to bring other unbelievers to Christ. “Bringing the English speaking person to the Word of God.” – The PlowShare Mission. Remarkable work that you’ve gotten at this website. Don’t forget keep up to date the superb work.Most definitely i’ll without doubt visit to get knowledgeable. how i join esword could u please let me know. God bless you,please me guidance on to study E-sword bible online.Thank you. No personal notes? Not that would make up for a lot of other weaknesses.